Rendering of a new data center campus GDS is building in Shanghai. The company announced the project in July 2017. US REIT creates an opportunity for investors eager to take advantage of the cloud growth in China. To compete toe-to-toe with some of the world’s largest data center operators at global scale, CyrusOne needed to find an edge in Asia. Building key relationships in Beijing, Shenzhen, and Shanghai – instead of focusing first on the more conventional tier-one markets like Singapore, Hong Kong, Tokyo, and Sydney – is a bold move toward finding the edge it needs. The world’s second-largest economy is growing at least twice as fast as the largest (US) and is expected to continue doing so for the foreseeable future. But China can be an opaque market for foreign businesses, with rules and regulations that are very different from those in other Asia-Pacific countries. 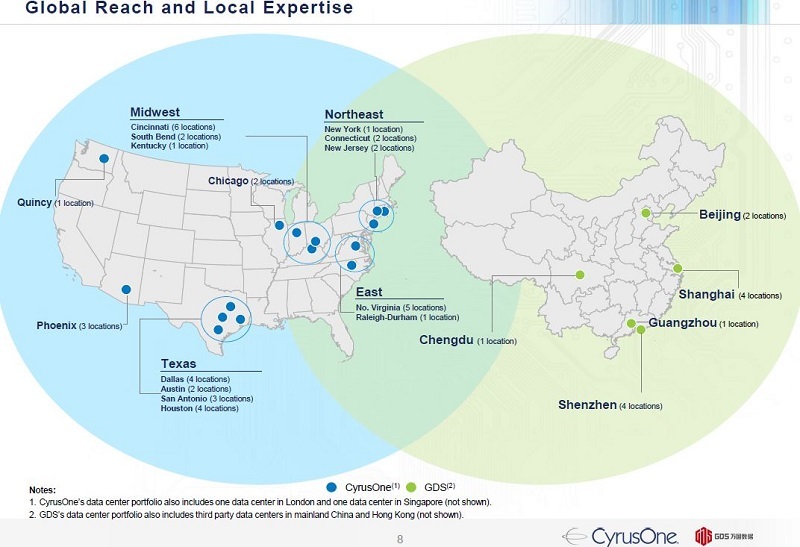 CyrusOne’s investment in GDS Holdings and strategic partnership with the Chinese data center services heavyweight could help its customers expand into China, while potentially also giving the Dallas-based data center provider an edge when it comes to winning business with Chinese hyper-scale cloud operators Alibaba, Tencent, and Baidu – a market sweet spot for GDS. Currently, CyrusOne’s international presence consists of data center space in London and Singapore. CEO Gary Wojtaszek has often said that “data has no borders” and discussed the need to expand internationally to better serve customers’ needs. The company counts all but one of the top ten cloud service providers among its 1,000 or so customers and serves 190 of the Fortune 1000. During the past few quarters, Wojtaszek has discussed expansion in Western Europe, with Dublin slated to be the next market there. Last week's announcement with GDS came as a bit of a surprise to many analysts and investors. Apparently, both companies had played their cards close to the vest. Wojtaszek explained during the joint conference call that discussions actually began shortly after the GDS US IPO late last year, with the first face-to-face meetings occurring this past January. In an interview with Data Center Knowledge a year ago, GDS CFO Dan Newman said no single US data center operator was comparable to GDS. Newman suggested some similarities with Equinix, due to having a primary focus on Tier 1 markets, but GDS actively leases to wholesale data center customers, similar to what Digital Realty does. He also described parallels to QTS Realty when it comes to offering customers in-house hosting and managed services options. GDS is essentially a hybrid provider, with about 50 percent of data center space committed to wholesale customers. We wrote about the GDS business model in more detail here. CyrusOne bought $100 million of GDS shares at a 4 percent discount, which has already led to a handsome paper gain on the 8 percent stake in the Chinese company it acquired by the end of the week. CyrusOne has agreed to hold the GDS shares for at least 12 months and not to increase its investment for at least 18 months. Clearly, US investors in data center stocks who were previously on the sidelines immediately bid up the price of the shares, becoming more comfortable with the eye-popping growth projections for GDS in China. However, CyrusOne's GDS investment serves to cement the relationship and underscore the C-suite commitment to the deal on both sides of the Pacific. Notably, GDS already has some powerful global investors, including ST Telemedia Global Data Centers, subsidiary of Singapore-based ST Telemedia, which owns a 40 percent stake in the Chinese player. STT is the top data center provider in India and has strong positions in Singapore and London. Its position in London recently strengthened, after it took full ownership of Virtus, a provider with six data centers in the London market. STT had previously owned a 49 percent stake in Virtus. Our growth rate has been most impressive in terms of bookings. For the whole of 2016, the new contracts which we signed (excluding renewals) will be worth around $120 million in annual service revenue when fully implemented. For the first half of 2017, the new contract value was $75 million in terms of annual service revenue. We believe that this level of new bookings puts GDS at the top of the global league table. CyrusOne has the highest growth rate in terms of new bookings among the US data center providers. This demonstrates how both of us are positioned in the sweet-spot of our respective markets. The strength of our new bookings, most of which are pre-commitment (pre-lease), is why we have built up such a large backlog - worth $163 million in terms of annual service revenue at the end of 2Q17. This gives us unusually high visibility for future growth." Newman confirmed a statement on the conference call that cloud service providers are generating over 50 percent of revenues for GDS. 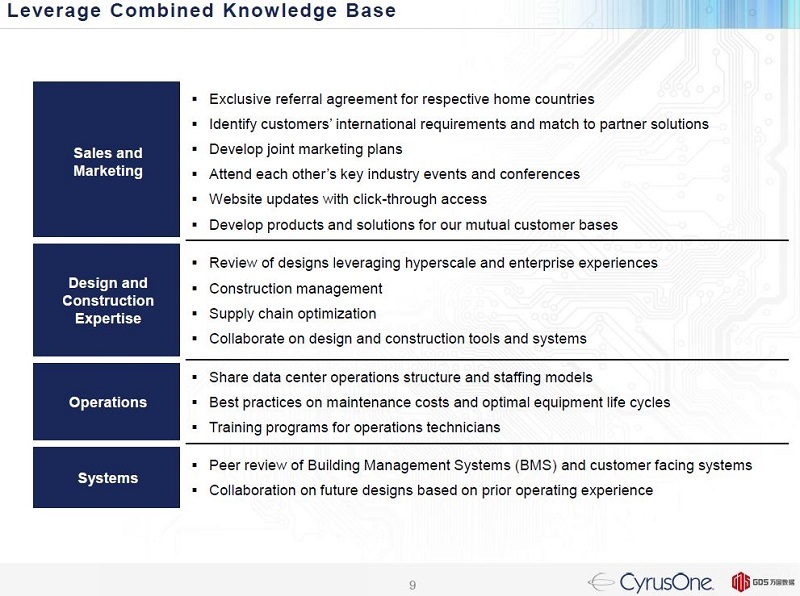 These are the type of customer relationships that CyrusOne and other US data center providers covet. 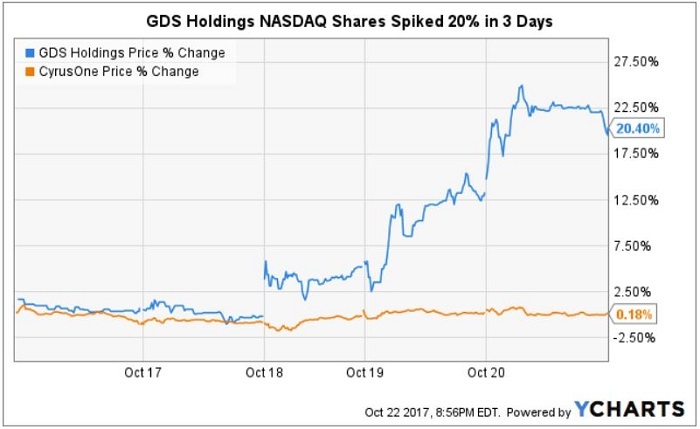 The GDS story is now front and center for US investors in data center stocks eager to find a way to cash in on the impressive growth in China. High NOI margins of ~61 percent on stabilized data centers with 80 percent occupancy make this the kind of growth story that shareholders crave. CyrusOne having done its due diligence prior to its investment -- along with Wojtaszek gaining a seat on the GDS board --- appear to have gotten the attention of eager Wall Street investors. However, in many ways this can be viewed as a real coup for CyrusOne. The company continues to "punch above its weight class" with this deal, seeking to gain an advantage when it comes to providing facilities for key Chinese cloud and e-commerce giants looking to expand.